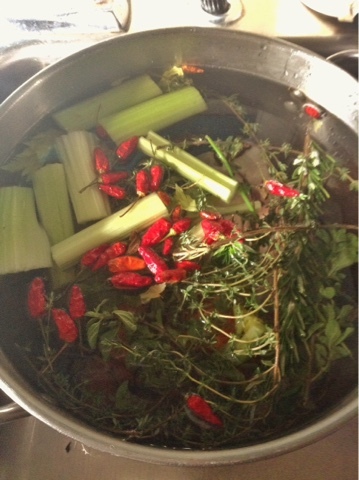 I love making stock- to have the pot bubbling away on a quiet weekend day. It fills the house with fragrance and much needed moisture. Some pork bones from the freezer, veggies, aromatics, whatever happens to be around. The finished product usually goes in the freezer to be used weeks later. Invariably I forget to thaw it out ahead of time and end up having to wait while it bobs in a hot water bath.